The Luxury Collection Hotels & Resorts, part of Starwood Hotels & Resorts Worldwide, Inc. (NYSE:HOT) , today announces the opening of The Azure Qiantang, a Luxury Collection Hotel, Hangzhou, in the capital of China’s Zhejiang province. With the openings of The Azure Qiantang and very recently The Castle Hotel in Dalian, The Luxury Collection brand includes six hotels as part of its distinguished portfolio in China, including the legendary Astor Hotel in Tianjin, Twelve at Hengshan and The Hongta Hotel in Shanghai, and The Royal Begonia in Sanya. Situated along the Qiantang River, legendary for the world’s biggest and most spectacular tidal bore, The Azure Qiantang is a perfect blend between Hangzhou’s traditional foundation of simplicity and elegance, combined with contemporary design elements. Designed by world-renowned architect Mr. Pierre-Yves Rochon, the hotel uses a blue glass colored structure which showcases design elements that reference the surging waves of the Qiantang River, merged harmoniously with the colors of the sky. The Azure Qiantang is named after “Memories of the South”, a masterpiece written by renowned Tang Dynasty poet Bai Juyi. 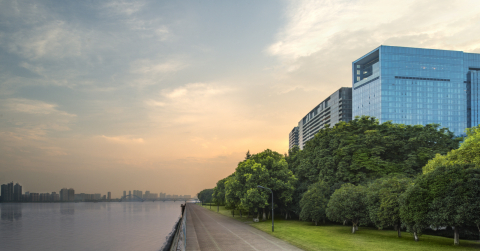 The hotel boasts 205 elegant guest rooms and suites, all with spectacular views of the Qiantang River. The hotel is equipped with a swimming pool, spa and a 24-hour fitness center for guests to pursue moments of deep relaxation or invigorating workouts. The hotel spa will feature seven treatment rooms and three massage rooms, offering moments to replenish the mind and body inspired by five of Hangzhou’s surrounding water elements, including the river, canal, stream, lake, and sea. Signature treatments include the “Enchanting Lotus Facial Therapy” which uses a potent blend of lotus extracts combined with ingredients rich in anti-oxidant, as well as the “Warm Seashell Bodyworks” which uses special heated seashells on fatigued muscles to provide deep relaxation, opening the energy channels. The “five waters” theme also carries throughout the authentic culinary experiences at The Azure Qiantang. The Lan Ting Chinese Restaurant features 14 private dining suites in addition to its main dining hall, providing a delicate and elegant ambience to partake in authentic Hangzhou-style cuisine, including a menu inspired by ingredients from Hangzhou’s lake, river, stream, canal and the sea. Prepared using traditional local methods, guests can look forward to dishes such as the “Four Treasures Water-shield Soup”, made with herbs native to the West Lake, and “Steamed Crabs with Chicken Oil and Rice Wine” with fresh crabs sourced from the nearby sea shore. At Panorama Restaurant & Bar diners can savor a range of favorite local snacks in addition to international buffets while taking in the majestic view of the Qiantang River. While seated on the Riverview Terrace on the 22nd Floor, guests can sip cocktails while enjoying the sunset. The Lobby Bar with its beautiful garden views is another ideal location for spending time while indulging in a lavish local afternoon tea. For meetings and celebrations, the hotel offers seven distinct rooms, all featuring natural light through floor-to-ceiling glass windows, as well as a Grand Ballroom spanning 650 square meters with its own 312 square meter foyer – each with stunning river views. The Azure Qiantang provides exceptional service, state-of-the-art equipment and brand’s signature Luxury Collection Concierge Service, providing guests recommendations and assistance to discover and experience the city. Hangzhou, which is famed across China for being the “Paradise on Earth”, has a deep and long cultural heritage and rich and enchanting natural scenery. The city is also renowned for its beautiful West Lake, fine-quality silk, delicate Longjing (or “Dragon’s Well”) Tea, as well as world’s largest and most spectacular tidal bore on the Qiantang River. Every summer, The Qiantang River attracts large crowds of international spectators to witness this impressive natural phenomenon, which dates back over 2000 years to the Han-Wei Period, and reached a peak during the Tang Dynasty. The Annual Qiantang Autumn Tidal Bore, which occurs on the 18th day of the 8th Lunar month, is considered the world’s largest tidal bore for its width and scope with sweeping waves fiercely thrashing along the river banks, making it one of China’s most unusual and spectacular sights. From now until December 31st, 2014, distinguished guests can enjoy the special opening package for the Deluxe Room at the price of RMB 1300* a night; for a more lavish experience book a consecutive night and receive complimentary breakfast for two persons. * The above room rates are subject to 15% service charge. The Luxury Collection(R) is a collection of hotels and resorts offering unique, authentic experiences that evoke lasting, treasured memories. For the global explorer, The Luxury Collection offers a gateway to the world’s most exciting and desirable destinations. Each hotel and resort is a unique and cherished expression of its location; a portal to the destination’s indigenous charms and treasures. Magnificent decor, spectacular settings, impeccable service and the latest modern conveniences combine to provide a uniquely enriching experience. Originated in 1906 under the CIGA brand as a collection of Europe’s most celebrated and iconic properties, today The Luxury Collection brand is a glittering ensemble of more than 85 of the world’s finest hotels and resorts in more than 30 countries in bustling cities and spectacular destinations around the world. The Luxury Collection includes award-winning properties that continuously exceed guest expectations by offering unparalleled service, style and class while celebrating each hotel’s distinctive heritage and unique character. All of these hotels, many of them centuries old, are internationally recognized as being among the world’s finest. For more information, please visit www.luxurycollectio.com.